My wife and I are somewhat avid bicyclists, and before having our first child, we frequently rode on local area bike trails, mostly preferring paved or packed trails, but occasionally venturing into mountain bike territory. 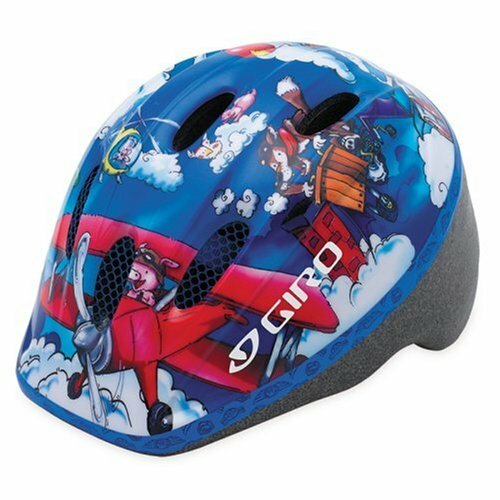 Once our son was old enough and big enough to wear a helmet, we wanted to expose him to the joys of riding. Our first thought was to purchase a trailer that could double as a jogging stroller, and could potentially support two children (planning ahead). We did some research and located what we thought was the best option in the Schwinn Joyrider PR150 Bicycle Trailer. While shopping at our local Wal-Mart, I noticed the WeeRide Kangaroo Child Bike Seat in the Bike section. What was interesting about the WeeRide was the fact that it places the child in front of you, rather than behind like most bike seats and, obviously, trailers – the ~$50 price tag of this seat was also appealing, as we had been looking at over $300 for the Schwinn trailer / jogging stroller. We also were worried that purchasing a trailer / stroller for two children when you only had one was a little too much forward planning. After some research on-line, I came across a competitor to the WeeRide that I had never seen before – the iBert safe-T-seat. The design is elegant in its simplicity and function – placing your child between your arms, providing your little one with a safe perch where they can see everything. While the price was higher than the WeeRide, it was still a bargain compared to the trailer. The reviews on Amazon where stellar, and we also flipped through some of the hundreds of customer pictures that had been submitted before deciding to make the purchase. For the jogging stroller, we ended up purchasing an InStep Safari (review pending) – with the iBert we had a total cost of just about $200. minutes to unpack the iBert from the box and connect the padding and about 1 minute hooking it up to your bike. The unit itself is a single piece of molded plastic with a roller coaster style lap bar that gives your little one something to hang onto and helps secure them – you attach a stainless steel “stinger” to your bike via two locking bolts, and then the iBert connects to the stinger in seconds. As many reviews mention, I don’t think I would ever ride without the seat attached as the empty stinger is about 5 inches of metal that protrudes ominously towards the rider – at a minimum I would loosen the stinger and spin it around to the front. We looked at a variety of helmets for our son – while his height has consistently been in the 95%+ percentile, his head size is below 50%, so we were worried about a comfortable fit. Trips to Wal-Mart and Target didn’t turn up anything, as they seem to only carry 4+ year old helmets. tolerant of hats or sunglasses, but he doesn’t try to remove the helmet. 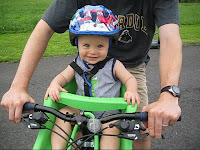 As you can see from the pictures, our son is a huge fan of the iBert and Giro . On the first few rides my knees did bump into the seat, but a quick seat adjustment cured it. I have to beware of my son’s tendency to shift gears on me, but usually he is too busy watching the scenery fly by to bother. My biggest complaint is that I can’t see the look on his face as we ride down the trail!